Region: Central Texas, in Smithville, one block from Main Street. You're invited to visit the Katy House Bed and Breakfast. Located in the beautiful, old railroad town of Smithville, Texas. This charming, turn-of-the-century, Texas bed and breakfast is handsomely decorated in American antiques and railroad memoribilia. 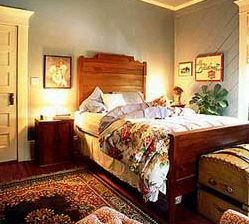 The Katy House Bed & Breakfast has been lovingly restored to its original beauty, keeping the guests' comfort and convenience in mind. Choose from five unique guest accommodation. All guest rooms offer a queen-sized bed and private bathroom. A delicious, full country breakfast is served in the main dining room every morning. While staying at the Katy House Bed and Breakfast, you will be able to enjoy all Smithville and Bastrop County, Texas, have to offer, including: golfing, walking or biking tours, and historical sites. Lake Bastrop, Bastrop State Park and Buescher State Park are only minutes away and offer several additional recreational activities such as hiking, swimming and picnicking.